Kelly McCullough was a Writers of the Future winner in 2000 and his short stories and poems have appeared in Weird Tales, Absolute Magnitude, Tales of the Unanticipated, The DNA Helix, Cosmic SF, L. Ron Hubbard Presents Writers of the Future Vol. XVII, Tales from the Black Dog, and other publications. Here’s Kelly McCullough’s website. CLICK HERE FOR MORE BY KELLY MCCULLOUGH. Ravirn (WebMage) — (2006-2010) Author’s website: A fantasy-cyberpunk hybrid that revolves around Ravirn, a grandson of the Greek Fate Lachesis. In order to keep up with an ever increasing number of life threads, the Fates have upgraded to a computerized system that blends magic with programming. Of course where there are computers, there are also hackers. In the process of “testing” his Great-Aunt Atropos’s security, Ravirn, a hacker/sorcerer, and his laptop familiar, Melchior, uncover a plot that could shake the foundations of Olympus and change humanity’s relationship with Fate forever. It’s time for another round of Beth vs. The Urban Fantasy Genre. Today’s contender is WebMage by Kelly McCullough. Mind, the quote on the cover has it right: Science fantasy is really a better term for it. But Webmage can and does fit into the urban fantasy genre as well. Only there’s a distinctive lack of vampires, werewolves, and love dodecagons. 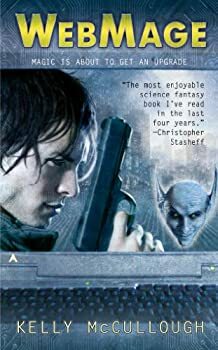 In fact, WebMage is kind of like the illegitimate lovechild of The Dresden Files, Percy Jackson and the Olympians, and some computer geek. And I mean that in a good way. 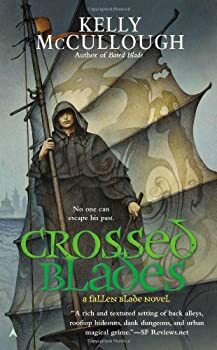 Fallen Blade — (2011-2015) Publisher: Once a fabled Blade of Namara, Aral Kingslayer fought for justice and his goddess alongside his familiar, a living shadow called Triss. Now with their goddess murdered and her temple destroyed, they are among the last of their kind. 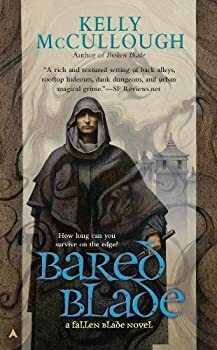 Surviving on the fringes of society, Aral becomes a drunken, broken, and wanted man, working whatever shadowy deal comes his way. 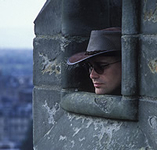 Until a mysterious woman hires him to deliver a secret message-one that can either redeem him or doom him. 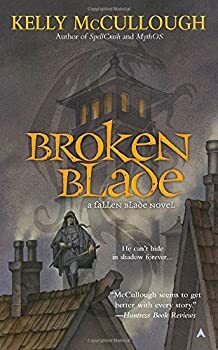 Broken Blade, the first book in Kelly McCullough's FALLEN BLADE series is a fun little fantasy novel. I picked it up as something to fill in space between “serious” series. In that role, Broken Blade exceeded my expectations because it was refreshingly simple and interesting all in one. In the City of Tien we are introduced to Aral. As member of a cult of assassins, called Blades, Aral was a rising star with great promise and great skills. Sadly, Aral's Goddess, Namara, is killed by other religious zealots and his order hunted down as outlaws. Aral is left bereft of the fellowship of his fellow Blades and the unwavering conviction of serving Namara. He falls into the depths of despair and becomes a simple sword-for-hire. Bared Blade is the second book in the FALLEN BLADE series. Kelly McCullough continues the story of Aral Kingslayer, survivor of the destruction of the Goddess Namara turned petty thief and spy. Aral is still struggling with the revelation that other members of his cult survived the fall of his goddess. His experiences in Broken Blade have started to give him an inkling that there may be more to look forward to than alcoholic oblivion. The relationship between Aral and his familiar/partner Triss has been an interesting twist on typical sword and sorcery tropes. Kelly McCullough’s FALLEN BLADE saga is a fun and fast moving fantasy series. I love a series that can incorporate humor along with the requisite action, magic and evil bad guys who need to be defeated. McCullough keeps things mockingly amusing by never letting the hero’s head get too big. 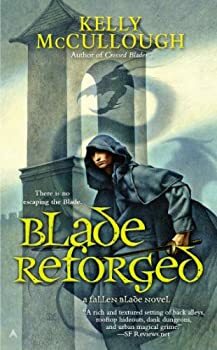 Kelly McCullough’s FALLEN BLADE series has been a lot of fun to read. For fans of cloak and dagger fantasy, it’s been a welcome, easy to read morsel. You really don’t need to pay close attention because the story is about humor, a little danger, long lost romance and loyalty to ideals that have been lost. It’s not complex, but it’s good. 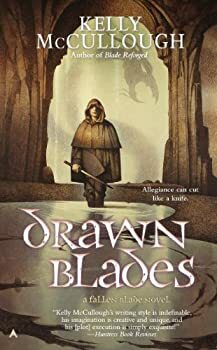 Drawn Blades is the fifth book in Kelly McCullough’s FALLEN BLADE series. This review will contain spoilers for the previous books. Aral Kingslayer has finally emerged from his mental paralysis after the death of his Goddess, Namara. It has taken eight years, a lot of alcohol and the death of some friends for Aral to reach this point. With a new-found set of ideals, Aral is ready to start making a difference.